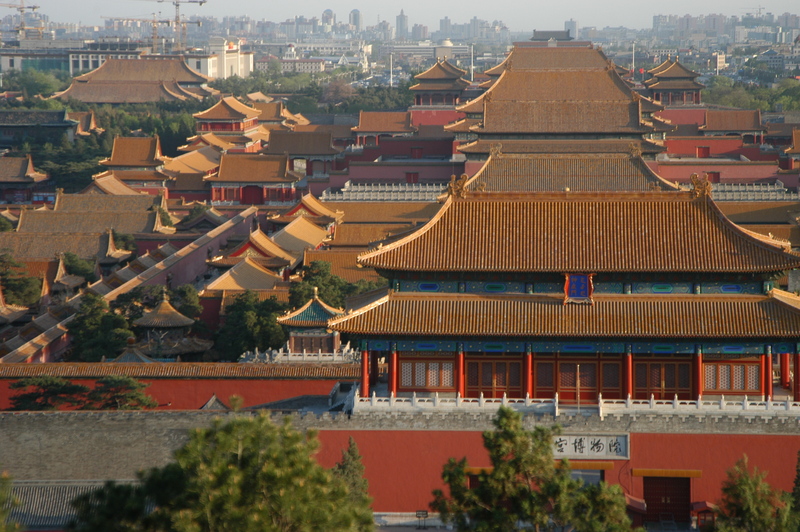 Chinese architecture: what makes it different? The very term Chinese religious architecture, which I’ve written about here before, and spoke about in Beijing a couple of weeks ago, is a misnomer. Pagodas are religious; imperial sacrificial altars, of which only a handful ever existed at any one time, are religious. All other building types in Han China before the C17 are barely distinguishable from each other: there is one way of doing architecture, and buildings are classified by status, not function. Exceptions are subtle: for example, Taoist temples are often on high platforms; Confucian temples sometimes have moon-shaped pools outside them; mosques of course have Arabic inscriptions and Qibla-facing prayer halls, sometimes of stone. But this kind of thing is small beer. This is remarkable. In all the other Major Civlisations (Ancient Rome excepted) there is a country mile in terms of scale, materials and/or form between religious buildings and other types of buildings. A Hindu temple could never be mistaken for a Buddhist one; from ancient Egypt to the ancient Khmer, the only buildings to be made of permanent materials were places of worship, leaving a landscape dotted with temple ruins in which the remains of homes are barely traceable. There are several reasons for this perfectly rational but very unusual Chinese approach to architecture. The two most pat ones both have some truth to them; firstly, this is a precociously humanistic culture, in which religious conviction is very varied and not the defining feature of society in the way it was in medieval Europe (or, traditionally, in Tibet); secondly, and in contradiction, religious ideas — spirituality, the desire to encourage efficacious and beneficient responses from a spirit-world, small daily rituals — suffuse architecture/culture of all types, so there is no reason to separate a house from a temple. This is true of many, perhaps most, traditional cultures, but in China it has had a profound impact on buildings. If the temple is a home, the home is also a temple. Perhaps an extension of this, while the Song-era Chinese building manuals, the Yingzao Fashi, make no distinction between a temple and any other kind of building, they emphatically distinguish imperial buildings, palaces and temples alike, from others; and by the same token the oldest buildings to exhibit the key characteristics of Chinese architecture, around the start of the first millenium BCE, seem to have been at once temples and palaces. In other words, one of the reasons for this cross-functional approach is that traditional Chinese culture placed huge store in the religious role of the emperor as the ritual glue between heaven and earth. There thus is a sense in which palace and temple are overlapping categories. One can push this too far: the notion that royal power is also divine power is the motivating force behind many great temples in many great cultures without their also literally being palaces, but nevertheless there is much in it. Finally, there is the simple fact that China achieved an infinitely modular and flexible architectural tradition and had good reason to consider it good for any kind of building, resulting in structures grand, flexible, beautiful and practical enough to suit all needs. 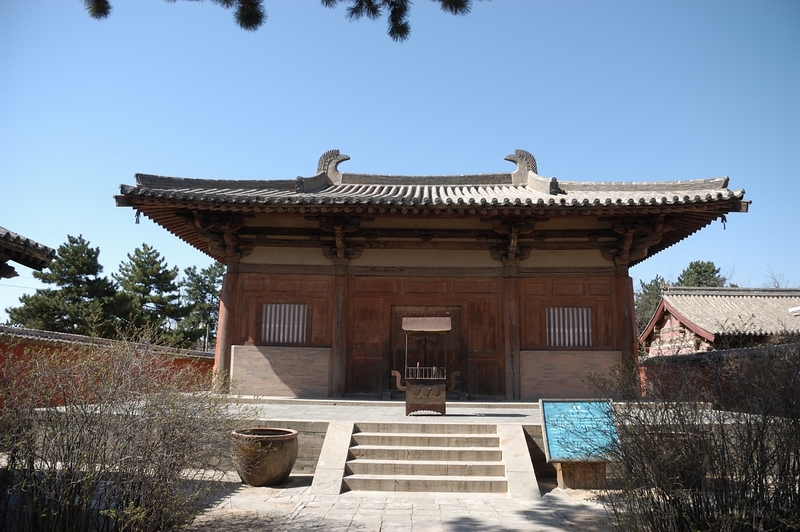 The Buddhist temple at Nanchansi, Shanxi, one of the oldest complete buildings of timber on the planet. Allied to this is the most striking thing about these buildings, compared to their peers in other cultures. They are rarely enormous: in all China, as far as I can see, the Temple of Confucius at Qufu, Shandong is (as far as I can see) the only emphatically religious complex to bear comparison in terms of size with (say) the great medieval Christian buildings which are frequently seen in Europe. Perhaps, if the scale of their surviving comparitors in Japan (such as the Todaiji, Nara) is anything to go by, this was different under the Tang. We don’t know — and we don’t know because the Chinese, very remarkably, as well as never going for the truly gargantuan and emphatically religious structures which, from Angkor to Thebes, from Baghdad to Cordoba, from Tieotihuacan to Samarra, were seen elsewhere, never developed an aspiration to permanency; that is, they never did what everyone else did, which is convert an architecture of timber to one of stone, brick or tile. This is most remarkable. It reminds us that this step, while it occurred everywhere else, is actually rather odd. What made the ancient Americans, the Buddhists, the Greeks and the Egyptians respectively, to take four early and clear examples, decide the religious buildings, unlike any other kinds of building, should be made of permanent materials, even if the result was simply a carbon copy of an archjitecture that already existed in timber or mudbrick or bound reeds or whatever, is one of the world’s great architectural mysteries, and the answer, it seems to me, is likely to be bound up with religion itself. But in China, in spite of perfectly excellent traditions of masoncraft, and various interesting exceptions-to-the-rule, this simply never happened. This has enormous implications. It means little in China is genuinely old. In an ancient culture — while by no means the oldest architectural tradition on earth, Chinese traditional architecture is still with us, and has arguably been around longer and with even greater continuity than the nearest (just-) surviving competitor, the architecture of Classical Europe — it is odd to find few buildings older than 2 or 300 years. It is also hard to ‘read’ structures that will look identical if renewed yesterday or thirty years or a century ago, and whose maintenance in any case requires constant replacement of parts. It creates an enormous perception gap when people from China come to view the genuinely ancient, multi-layered structures found elsewhere on earth (especially in ancient Egyptian, Christian and Islamic cultures). It plays games with outsiders’ approach to what they are seeing, and perhaps with locals’ understanding of what is old (and whether ‘oldness’ matters), too: the whole shebang of authenticity gets mixed-up. It also means that in China we are seeing, still being built today (if ironically often in very permanent concrete), the equivalent of pre-Doric Greek temples, pre-Imhotep Egyptian temples, or pre-chaitya cave Buddhist prayer halls: a surviving mature architecture of impermanent materials. It is as if the architectural history current elsewhere is here being read backwards. These major exceptions-to-the-global-architectural rule must also reflect centuries of lost conversations, in which incoming Buddhist, Islamic and Christian architectural traditions have to adapt themselves to the architecture of the far east, rather than vice versa; ie that their practitioners have to accept the local way of building over that they might have brought with them. The churches built by the Jesuits in China in the C17 are the first buildings to successfully insist that their way of doing things is superior to, or must be used for the religious buildings of, their culture rather than the Chinese alternatives. And all this is in spite of the existence around the borders and within the bounds of the empire, of the opposite, more globally normative, tradition. Architectures of stone, in which religious buildings emphatically stand out from other types of building in all kinds of ways, following south-east Asian traditions in Yunnan, central Asian traditions of Arab and Persian origin in Xinjiang, and a distinctive and unique blend of Indian and Chinese and indigenous in Tibet. 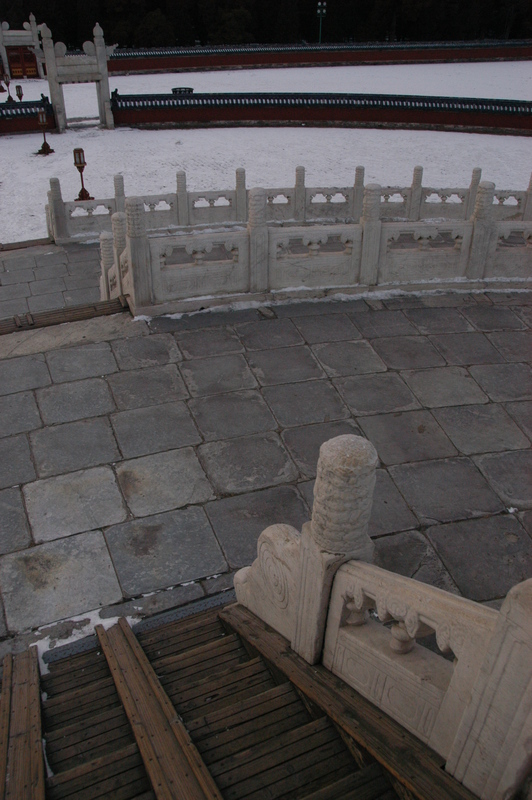 The Circular Mound Altar at Tiantan (the Temple of Heaven), Beijing, midwinter solstice 2012: unique survivor of an ancient tradition. I’ve written before about the significance to all this of the imperial sacrificial altars. While always few in number, they are the only building type to be both emphatically religious and indigenously Chinese. The Temple of Heaven is by far the best surviving example of a kind of building that can only ever have existed in small numbers near to an imperial capital. Here the world famous and beautiful circular Hall of Prayer for Good Harvests is more of a one-off and was often less important, both as an example of the type and in terms of its original ritual role, than the other main Circular Mound Altar. The latter structure bring up a whole range of themes: firstly, this is an architecture of open-air ritual settings, a manipulation of a landscape, of a type that was commonplace at the birth of architecture — the henges of north-west Europe bear illuminating comparison — but which nowhere else was preserved into the modern world (it was last used about a century ago) and in the process became a sophisticated and complete architectural form in its own right. So once again, China is turning the global chronological picture on its head. Secondly, it is a reminder of the significance of landscape in Chinese architecture: the setting of buildings is crucial, and charged with sacral ideas about how buildings and landscapes should interact if man is to be in harmony with the forces of the natural world. This wider sacred landscape survives in China’s network of sacred mountains, etc, and more crucially from an architectural point of view, it survives in the footprint of the capital city. In spite of its violent makeovers of the 1950s and since the 1990s (it’s still underway), the great north-south axis and nested enclosures of a carefully-laid out imperial capital, every detail of which reflects religious ideas about the architectural setting in which imperial power would be most divinely efficacious, survives: the ring roads and grids of the modern city are extending it out into the surrounding plain. Such planned ‘sacred cities’ existed in other cultures, but I don’t know of anything surviving of this scale and sophistication: it is in itself a work of global significance. How many of those who visit the Olympic park know that its site is on the symettrical north-south axis at the core of the city’s cosmology? How many of those who go boating on the lake in Behai park, with its pretty Nepali/Tibetan dagoba, realise the protective role of the park itself in this layout, or that Qionghua island is a giant 3-d model of a Buddhist mandala? Much more ubiquitous in the Chinese landscape than the imperial altars, however, was the other uniquely religious building type of traditional China: the pagoda. But this, the stretched-out and sinicised Buddhist stupa, is not indigenously Chinese: in function and symbolic design, at least, it is Indian, albeit given a strong East Asian twist, its tower like form combining the elaborately composed and tower-like stupas of Central Asia with indigenous watch towers or ges. Pagodas existed in great variety, and were often of brick or stone: their rapid spread in the first millennium BCE must have had a dramatic impact on the appearance of the country, introducing permanent and distinctively religious structures for the first time. It is not often noted, however, how they diversify, being placed in the landscape for all kinds of reasons not originally intended and not at all particularly to do with honouring the Buddha (such as to bring good feng shui), and ultimately almost disappeared, being replaced by the Buddha image as the essential feature of a temple in a manner not seen in other Buddhist architectures, where the stupa remains the defining structure of a temple. I guess two buildings of ancient China are known across the world: the pagoda and the Great Wall. The two make an illuminating compare-and-contrast sequence, in which the Wall symbolises a closed, inward-looking, bureaucratic and autocratic picture of this society, while the pagoda, as well as providing the most concrete link between Chinese traditional architecture and the traditions that developed in the other major civilisations, embodies China’s oft-overlooked historic phases of openness, variety, experiment and spirituality. Dust going round and round, a recycling of itself,spreading on roeds, covering the dead in mounds, blooming in clouds, a great desert -on-the-move to shock the megoapolis into its shrinking smallness, shunted by an army of aunts from stairwells and kitchens and deep-pored underwear, wiped up from its settling place by a billion feet and a million tyres, crushed deep into local mountains, sorted by a thousand shifting hands, tidally made and remade by an unconscious compact of wilderness and man. Making the hills hang in a haze above hemselves, aculturated mists. Unlike sea-tides, dust-tides are unpredictable, a complex fractal compact of wind and man, billowing cumuli from roads uncapped by tarmac, an oceanic Yellow sea of wiped carbon, mountain-baked silicate, particules of human flesh. Mounding up at the foot of the scarp, like a beach against a cliff.